When ACA Director Gina Genova asked me to write an article about Ben Weber in honor of ACA's upcoming 75th anniversary celebration, I spent a lot of time staring at my computer, wondering how to begin. Should I start with a description of the highly eccentric man who rarely left his apartment, yet played a major role in New York’s musical life in the 1940s and 50s? Or with some words about the music; or perhaps with stories about my study with him in the four years before his death in 1979? As Ben’s life was full of contradictions and ambiguities, not easily encapsulated in a few catch phrases or sound bites, I decided the best strategy was just to plunge in, do some of each, and hope that what emerged would be a portrait of this unique artist that gives a sense of his true place in American music. Ben WeberBen Weber was born in St Louis, Missouri in 1916 and died in New York City in 1979. A self-taught composer, he was the first American to adopt the twelve-tone technique of Arnold Schoenberg. Musicologists consider him one of the most important and influential composers of his generation, and the list of performances and recordings is long and impressive. Orchestral works include pieces premiered and recorded under the batons of Leopold Stokowski and Leonard Bernstein; his chamber and piano works were performed by the instrumental virtuosi of the day, artists and ensembles such as Alexander Schneider, Mieczyslaw Horszowski, Joseph Fuchs and the Juilliard Quartet. Like his friend John Cage, Ben didn’t believe that you could teach anyone how to compose, which made him a brilliant composition teacher. He never made any attempt to impose a style, or to show you how to write your piece as he might write it—something that I did experience later on in my graduate studies! He had a very light hand. One of the first pieces I brought to show him was a song cycle on poems by D.H. Lawrence. He read through the piece (Ben read music as easily as someone else might read the newspaper), turned back to a measure midway through and said, “You know, you might put a trill on this note.” What might seem like a very minor suggestion opened a window for me, much more so than if he’d made a more direct criticism. It led me to think that the music could breathe more naturally; that I might look for ways to vary rhythmic patterns and not have so many events occurring on downbeats. In short, it truly gave me a way to rethink the piece. In the 1970s, when I knew him, Ben was living in an apartment on 103rd Street and Central Park West in New York City. He’d moved there in the 1950s, but twenty years later, the neighborhood had deteriorated, and people were reluctant to travel that far uptown. Since Ben had always preferred to stay home and have people come to him, he was pretty isolated in those days. Ben’s health was precarious, and as a result, he’d often call and cancel on the day of a lesson. His good friend Miriam Gideon (who lived only a few blocks down from him on Central Park West, and was one of the few people who did actually come and visit) emphasized to me what I already knew—that what I had to gain from these lessons was more than worth the effort of braving the crime-ridden IND subway train and re-adjusting my schedule to come uptown when Ben felt up to teaching. For all his physical ailments, Ben had a gentleness and a lightness of being that I remember with great fondness. Much of his communication with people at that point was by telephone, and he’d often call quite late at night. There was the time when he phoned around midnight and told me to stop whatever I was doing, go outside and look at the full moon, which I guess he’d seen from his window overlooking the upper reaches of Central Park. I’ll always be grateful that I had the opportunity to study with this truly great artist, at a time when I was just starting out in music, and to do it in the traditional way of a musical apprenticeship. Ben emphasized the value of finding ways of encouraging your unconscious mind to lead your thinking and, with luck, take you to places where you might never have consciously planned to go. For example, he suggested beginning work on a piece by writing a list of words—not poems, just words. Adjectives were his choice. He said he often used this technique to get his creative thoughts flowing. To illustrate, he chose two words, “peripatetic” and “voluptuous,” and wrote a line of music inspired by each word. I’ve used this technique many times when beginning work. It’s a brilliant way of confronting Mallarmé’s blank page. Shortly after Ben died, I wrote a piece called Column: In Memory of Ben Weber for English horn and string orchestra. I used the music Ben wrote for “peripatetic” as the theme material for the middle scherzo, and quoted the music for “voluptuous” at the end of the piece. Almost all of Ben’s music is written with reference to a twelve-tone row, but the harmonies he creates are lush, bittersweet, ambiguous-- and often frankly tonal. 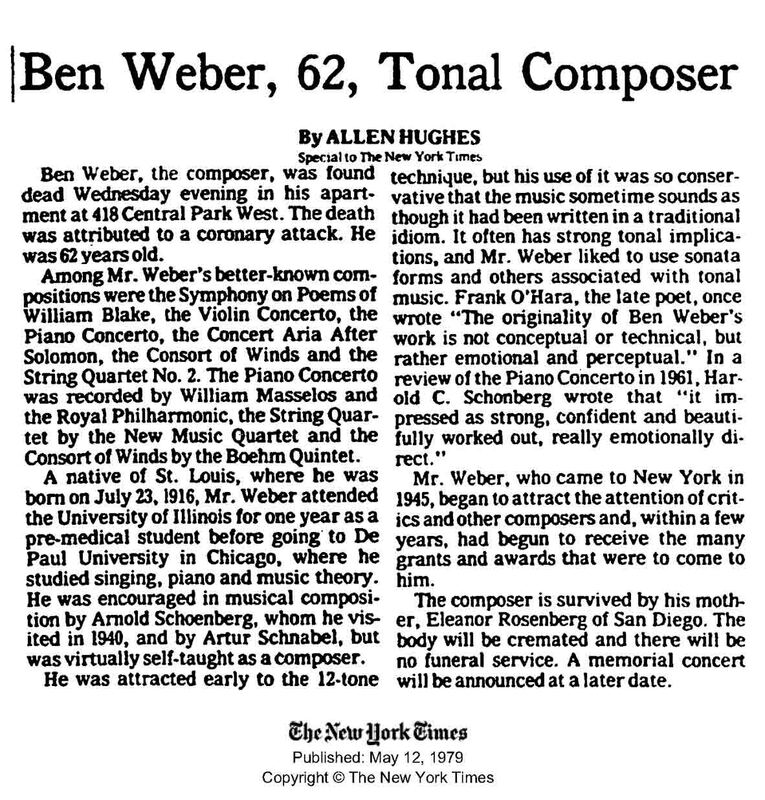 So much so that the headline of his New York Times obituary read, paradoxically, Ben Weber, Tonal Composer. While his works contain sections of dense contrapuntal writing, they are always written and orchestrated with a transparency and lightness that plays against the complexity of the musical thinking—very different in effect from the dense constructs to be waded through in the music of some of his contemporaries. A very vivid memory of studying with Ben is of the times when we would listen to music together. He would play a recording and we would listen through with the score. As the music proceeded, he’d make the occasional comment; pointing out a detail of structure, harmony, or orchestral technique. One of the first pieces of his own that he played for me was his Symphony on Poems of William Blake. He liked that it got quite wild in the Mad Song, and was pleased with the way the small forces he had chosen created such a big sound. Of particular interest to me was the way that he’d used a single cello to successfully create the sound of a full string section. The Blake Symphony is one of Ben’s most powerful works, and we listened to it in the fabulous recording conducted by Leopold Stokowski, with his Symphony Orchestra and baritone soloist Warren Galjour. When we’d finished listening, Ben reminisced about the craziness surrounding the sessions for that RCA Victor recording. Stokowski, for some unknown reason, had become very angry with Galjour. So, when a comment needed to be made, Stokie, as Ben called the famous conductor, would turn to Ben and say, “Would you please tell Mr. Galjour such and such, because Mr. Stokowski is not speaking to Mr. Galjour.” As I listened to Ben’s story, the contrast between now and then was a bit haunting. Here I was, sitting in that cramped and dusty apartment with the creator of this phenomenal piece of music, now someone who barely ever left his rooms—and many days probably didn’t even get out of bed—hearing him tell tales about working with the legendary Leopold Stokowski. Stokowski was part of the magic of Disney’s Fantasia, the cartoon popular with children in the 1940s and 50s, and these days, kids are enthralled with magic via the Harry Potter series. At age 22, I had the chance to pay many visits to someone who was truly a wizard. Ben lived as a recluse in a dingy, crowded apartment, but, like Prospero in The Tempest, he could transform the atmosphere around him into something “rich and strange.” His living room, perched high above what was then a dangerous and derelict Central Park, became a spacious, magical place, full of light, where one could absorb profound thoughts and feelings about art, music and life itself. One afternoon, we listened to all of Gurrelieder. The vocal score we used had been signed by Schoenberg. This was a piece which went to the heart of Ben’s musical and philosophical thinking. 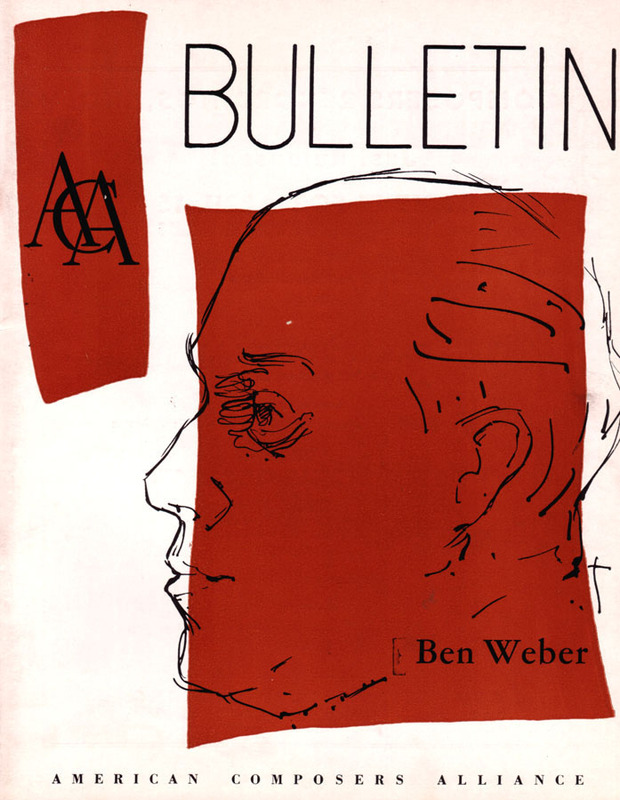 At one point, he said, “I learned everything I know about composing from Gurrelieder.” The section where King Wa Ben Weber cover of ACA Bulletin magazine, Vol. 5.2 (1955)ldemar curses God was a strongly personal metaphor for Ben. When someone asked him why Schoenberg needed ten horns, he said, “Well, you idiot, it’s so he could have a whole chorus of the same instrumental color.” Listening to Gurrelieder with Ben was a moving experience. But it took an extraordinary effort to keep my focus on the music, as Ben’s intense emotions connected to this music were so much in the air and right on the surface, pervading the atmosphere as the recording played and he turned the pages of the score. Throughout his life, he supplemented his income as a music copyist. Of course, it was partly from financial need, but I suspect that there was something in Ben that was drawn to the work. I had the sense that it appealed to him almost as if he were a monk in the Middle Ages, copying manuscripts; it seemed to soothe his soul. He copied the revision of Four Saints in Three Acts for his friend Virgil Thomson, and his own music is exquisitely presented, hand-copied in what is now pretty much a lost art. He was also a musical autographer. In those pre-computer days, autography was a method of copying music to make it look exactly like an engraved score, utilizing a combination of hand-drawn elements and press-on type. When I knew Ben, he wasn’t copying other people’s music any longer, but still did the autography for the short musical examples printed in the New York Philharmonic program notes. 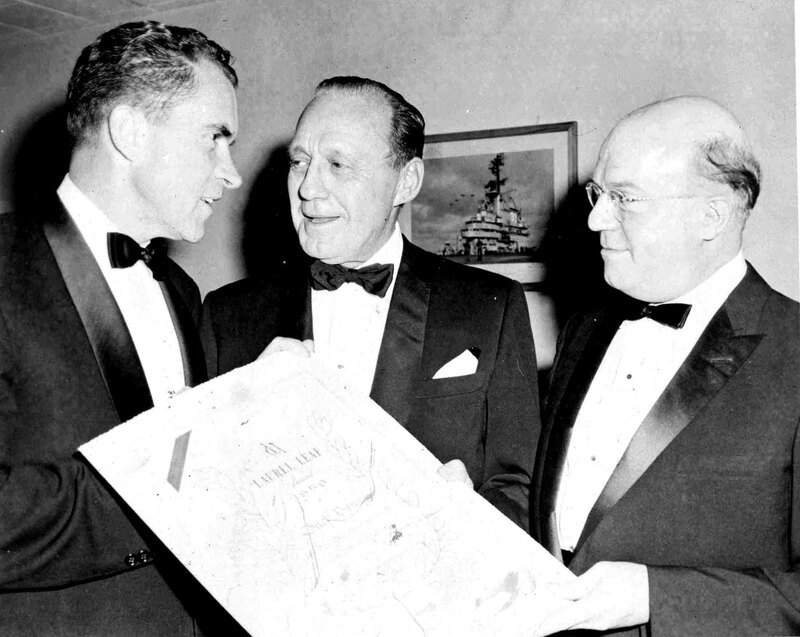 (from left)Vice-President Richard Nixon, comedian Jack Benny, and ACA President, Ben WeberACA's Ben Weber presents the Laurel Leaf Award to Jack Benny, 1959Of course, there were times when he did go out. There’s an interesting photo of Ben from 1959, taken at the President’s Black Tie Ball at the National Press Club in Washington. As president of ACA, Ben is shown presenting the ACA Laurel Leaf award to Jack Benny, honoring his tireless efforts to raise money for symphony orchestras with his comedic violin playing. Vice-President Richard Nixon (who had accompanied Benny on the piano as part of the proceedings) completes the group. When I knew him, musical tastes were changing, and Ben’s music less frequently performed. Shortly before his death, however, he received the news that his Fantasia was the most performed piece at a recent Kennedy Center piano competition. I think it pleased him to know that this piece, originally written and recorded by his great friend William Masselos, had now solidly entered the piano repertoire. So then he had to get the piece written. He told me that his only recourse was to get out of bed each morning and just stand naked at the piano and compose. He did this every day until the Concerto was finished. Ben was portly, and the image of him standing naked at his piano, pen in hand, is endearing. Michael Colgrass recalls the same story in his memoirs and writes that thinking of Ben “standing naked at the keyboard, composing furiously” helped him through many deadline crises (Michael Colgrass, Adventures of an American Composer). But, humorous aspects aside, it seems to me that this is the true archetype of the artist: standing naked before the world, stepping into the unknown, one note (or word or brushstroke) at a time. With ACA about to present one of Ben’s major works on June 23rd, this seemed like the time to do just that. Ben was my mentor, my friend and a mysterious and wonderfully endearing person, full of the contradictions and complexities that make up the human condition. It’s moving to have the opportunity to remember him this way, as the person he was. But what is most important is to recognize the beauty and power of his music, music which will most surely live on, bringing delight and revealing secret truths about the universe to many generations to come. © Copyright 2012 Roger Tréfousse. All rights reserved. Used by permission of the author. 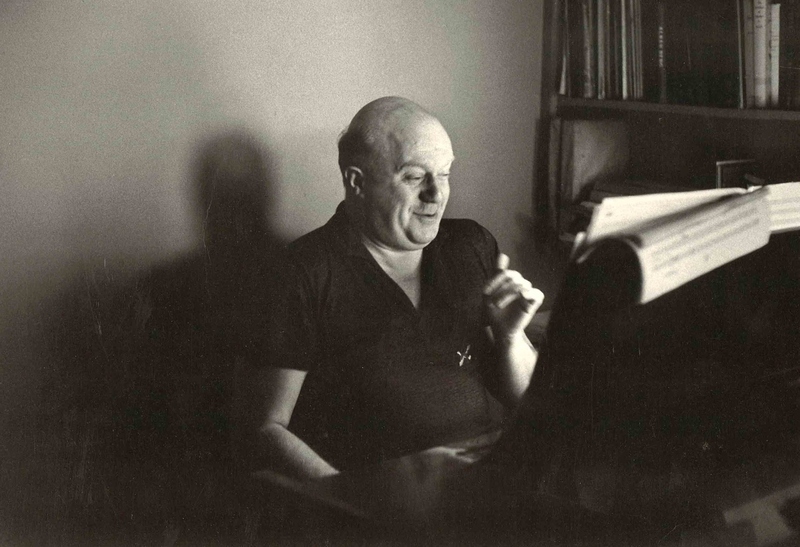 Roger Tréfousse is at work on a biography and critical study of Ben Weber and his music. *On Saturday, June 23, 2012, hear a rare performance of Ben Weber's Concerto (piano, cello) Op. 32, performed by Orion Weiss, Fred Sherry, and the Orchestra of the League of Composers, presented by the American Composers Alliance at Symphony Space. For tickets, call the box office 212-864-5400 or use this link. Many of Ben Weber's music scores are available through the ACA Custodial Management Plan Archives, a program of ACA that offers preservation and continued distribution of ACA-published music scores into the longterm future.